The effort to ban plastic carryout bags in York, Maine began in 2013 when community members began to organize around shared concerns related to plastic bag waste. York is a coastal community, and residents were concerned that plastic bags were polluting the marine environment. Additionally, the unwanted bags clogged sewers and contributed to roadside litter. Following the lead of Portland, Maine, which had recently assessed a fee on plastic carryout bags, community members in York formed an organization to address plastic bag waste locally. 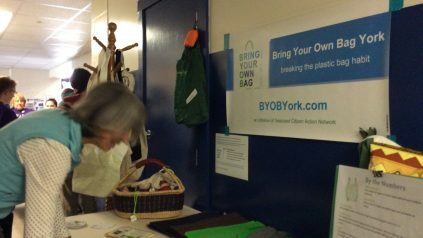 The idea for a plastic bag ban in York initiated from a community group called Bring Your Own Bag York (BYOB York). 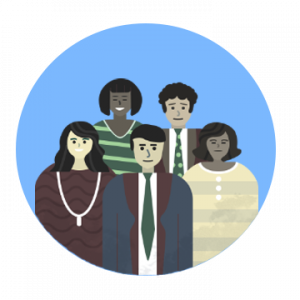 The group began with ten members and operated off of a self-funded budget supplemented by donations collected at public events. 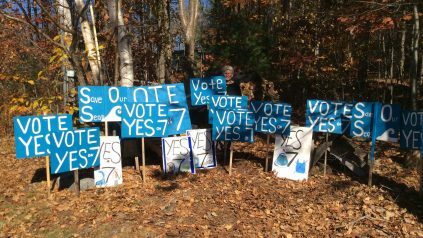 The group was able to secure two grants from the New England Grassroots Environmental Fund to purchase a banner, business cards, and reusable bags, which helped raise awareness of the issue in the community. BYOB York also obtained a Sustainability Initiative Seed Grant from the Natural Resources Council of Maine to conduct community outreach and garner support for the ordinance. The town of York implemented Maine’s first Single-Use Plastic Carry Out Bag Ordinance on March 3, 2016. Enacted in November, 2015, the ordinance bans the sale or distribution of single-use carryout bags less than 3 mils, while allowing reusable plastic bags, recyclable paper bags, and thin plastic bags without an integral handle (like those used for dry cleaning, produce, and bulk goods). One important challenge that the group faced was time: the effort to ban plastic bags spanned multiple years, and required a dedicated base to maintain support and keep the process moving forward. BYOB York also changed its focus as the effort evolved, from proposing a ban on plastic bags and a fee on paper bags, to simply banning plastic bags. This tradeoff enabled the ordinance to advance, given public concerns about affordability and equity associated with fees for paper bags. Build a coalition: BYOB York members contend that the passion and dedication of the group are more important than its size. Additionally, making contacts with others in the community is critical to building a successful bag ban. The support of local elected officials, small businesses, and community members was critical to the project’s success. 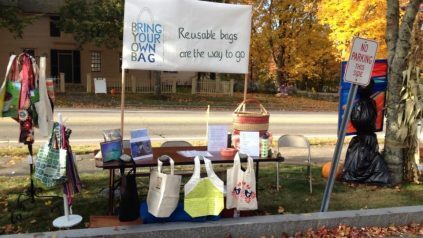 Increase visibility: BYOB York found that the more visible the issue was, the more the community was willing to support the bag ban. Public presentations, hearings, and community education were tools that BYOB York found to be helpful in increasing visibility of the issue. Recruit local youth: Children were important stakeholders within the bag ban process in York. 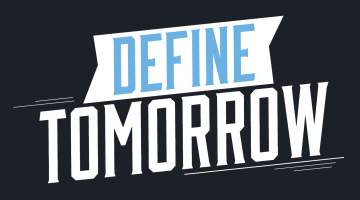 In addition to bringing the issue home to their families, young people in York created videos, participated in public hearings, and hosted creative public events like a “Trashion Show,” where students crafted clothing out of waste. Make reusable bags easy: BYOB York hosted reusable bag crafting events, including a “make your own t-shirt bag,” and gave away durable bags to ease the transition from plastic to reusable bags. 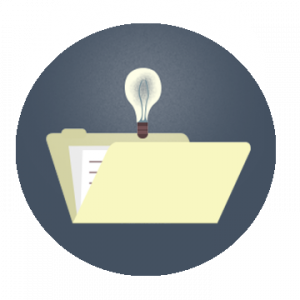 Share successes: By sharing successes and maintaining an active web presence, BYOB York was able to help initiate plastic bag legislation in Kennebunk and Freeport.